[S422] Index Card to Salt Lake Temple, Salt Lake TIB #3335, Book E lvg. Page 142. 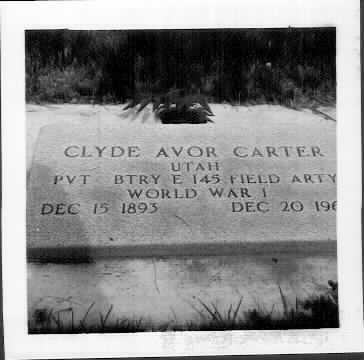 [S279] Death Certificate, Certificate of Death in possession of Elva B. Carter..
[S52] Utah Burials Database, Utah State Historical Society, (Internet web site), http://utstcess.dced.state.ut.us/NEWBURIALS/Silver., http://utstcess.dced.state.ut.us/NEWBURIALS/SilverStream/Pages/pgLongOne.html?CEMETERY_ID=UT2, 601&BURIAL_ID=3292, Carter, Clyde Avor, Gender: Male, Birth: 12/15/1893, Nephi, Utah, Death: 12/20/1968 , Provo, Utah, Buried: 12/23/1968, Comments: Ww I Veteran (t61). [S291] Marriage Certificate, Certificate of marriage from Salt Lake temple in possession of Elva B. Carter..